Kate Middleton recently stepped out in a sale navy blue dress from high street brand ASOS.com. Kate Middleton, 31, chose the navy knee-length dress as she shopped for curtains and drapes to decorate her unborn child’s nursery in Chelsea last week. The £17.50 ($27.50) dress was originally priced at £25 ($39), and the thrifty royal teamed it with a pair of her favorite £80 Pied a Terre wedges, creating a simple, stylish look that mothers-to-be are sure to rush to copy this summer. The viscose dress comes in sizes 6-18 and three different colourways. It features an elasticated waist and is designed to grow with an expanding stomach, making it even better value for money as it will last for the duration of a pregnancy. It’s the first time Kate Middleton has been spotted in a maternity outfit by the retailer. Previously she has worn pretty Topshop dresses or customized designer pieces by pricier labels including Emilia Wickstead, Jenny Packham and Tara Jarmon. 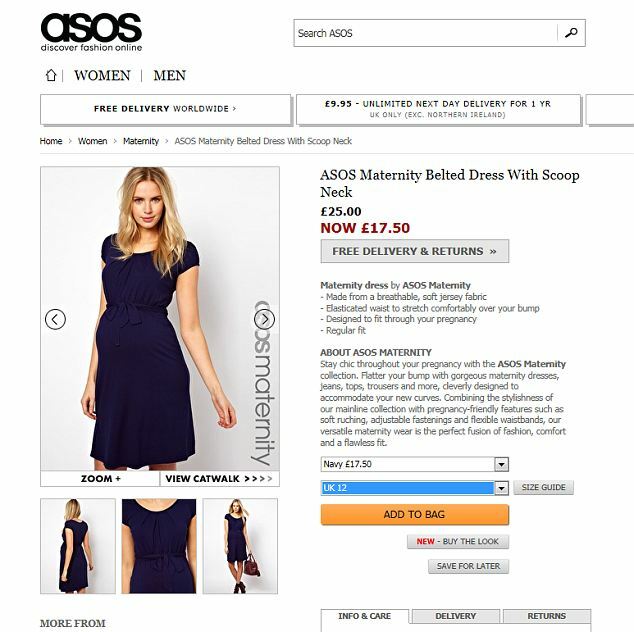 ASOS.com’s maternity line features hundreds of items including on-trend dresses like Kate Middleton’s, tops, skirts, slogan T-shirts, jeans and swimwear. The collection, created by the in-house design team, is described as allowing mothers-to-be to “stay chic throughout your pregnancy. Flattering your bump with gorgeous maternity dresses, jeans, tops, trousers and more, cleverly designed to accommodate your new curves’. It claims to ‘combine the stylishness of the mainline collection with pregnancy-friendly features such as soft ruching, adjustable fastenings and flexible waistbands, the perfect fusion of fashion, comfort and a flawless fit”. Celebrity fans of the off-the-peg pregnancy styles include The Saturdays’ Frankie Sandford and Rochelle Hulmes and Fearne Cotton. Kate Middleton is known for her eclectic wardrobe, whoch features both haute couture and high fashion, and her ability to mix the two on and off duty has earned her style plaudits from around the world.